2. Heat oil and butter in a large frying pan. Add the onions, vinegar and a pinch of salt, cover and allow to caramelise, approx 30 minutes. 3. Place the pears in a separate saucepan with a little bit of water, cover and cook over low heat until soft. 4. Grease and line a round pastry tin. Press the dough into the pastry tin to cover the sides as well. 5. Spread the caramelised onions onto the pastry and top with camembert. 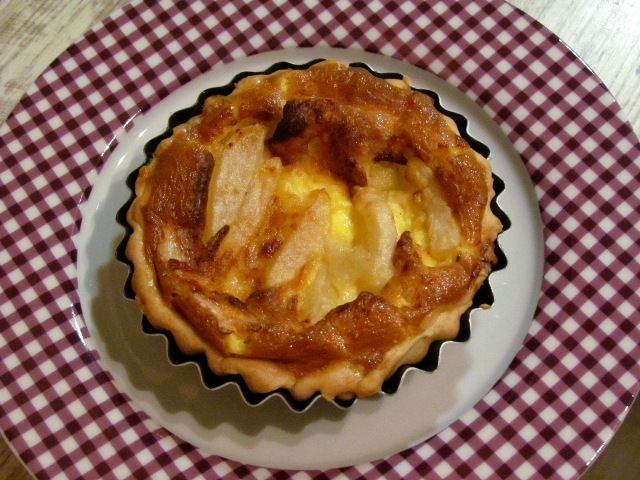 Arrange the cooked pear slices on top of the onions and cheese. 6. Whisk together the cream and eggs, add the thyme and the remainder of the salt. Pour into pastry and bake for 40 minutes. *This is a delicious recipe, perfect for a picnic in the Forest.